Here at Alpha Driving School, we are fully qualified DSA instructors and operate within a 10 mile radius of Farnham. We are also fully qualified for instructor training. work at a pace that you are happy with. ALPHA driving school is more than just another driving school. 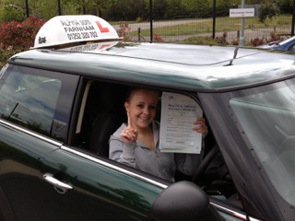 It’s a whole new philosophy for driving tuition: from learner, to licence, to lifelong skills. We will not just instruct; you will be inspired by professional coaches using the latest coaching techniques. It also means we don’t just focus on getting you through the driving test (although our first time pass rate is exceptional); we’ll go further, putting lifelong learning at the heart of all we do. At ALPHA driving school we believe you should never stop learning to drive. We offer a first class instruction service in clean, comfortable, up-to-date dual controlled cars and have manual or automatic cars available. We will provide you with only the best driving knowledge and help you to pass your driving test with ease. Today I passed my driving test third time lucky with only four drivers faults! New areas are constantly being added - just call to find out if your area is now included!